Nov 20th, 2009 – Coincidence, anyone? 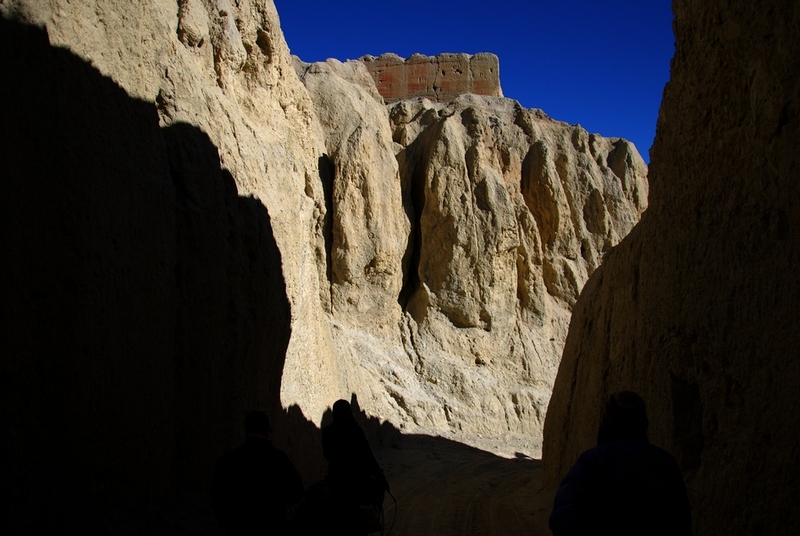 Shortly after returning to Kathmandu from Mustang my friend Tim came across an article on National Geographic’s News website titled “Shangri-La” Caves Yield Treasures, Skeletons, detailing an excavation of some of the mysterious caves dotting the mountains throughout Upper Mustang. I was desperate for information. Now I have some. This article was posted on Nov 17th. I returned from my trip on the 16th. Their corresponding PBS special aired on the 18th (scroll to bottom). K-K-K-Koooooky! Had I read this before I departed I would have donned my Spiderman costume and started spelunking my balls off. Perhaps, it is better this way. 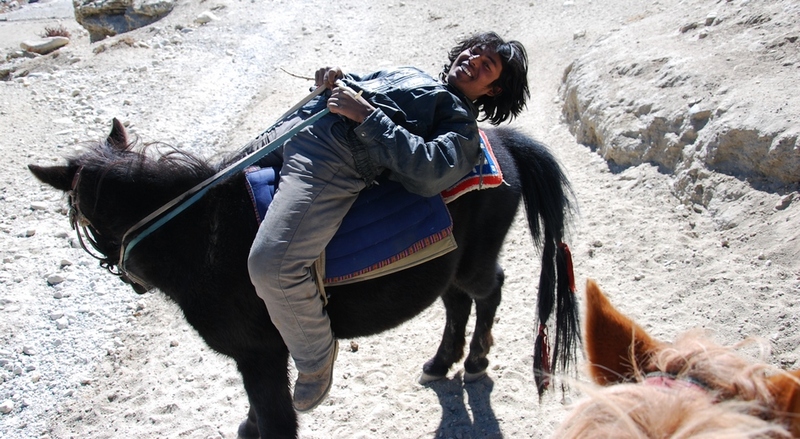 During the ‘60s after the Chinese tightened their grip on Tibet and the Dalai Lama went for a stroll from which he never returned Mustang was a hotbed of insurgency against the Chinese led by Khampas, Tibet’s most ferocious warriors. 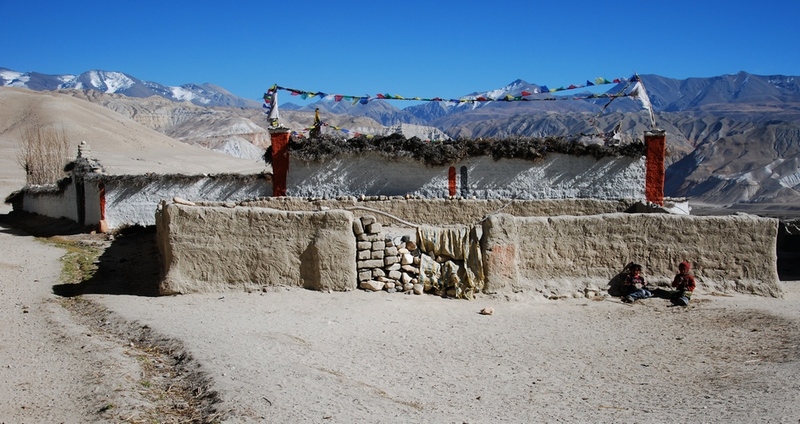 At the height of operations there were thought to be at least 6000 soldiers in the area, as well as adjoining regions (such as Dolpo). Not surprisingly they initially had the support of the CIA (God Bless America). Everything changed when Kissinger and Nixon decided it was to time to play kissy-grabass with Mao in an effort to improve relations. 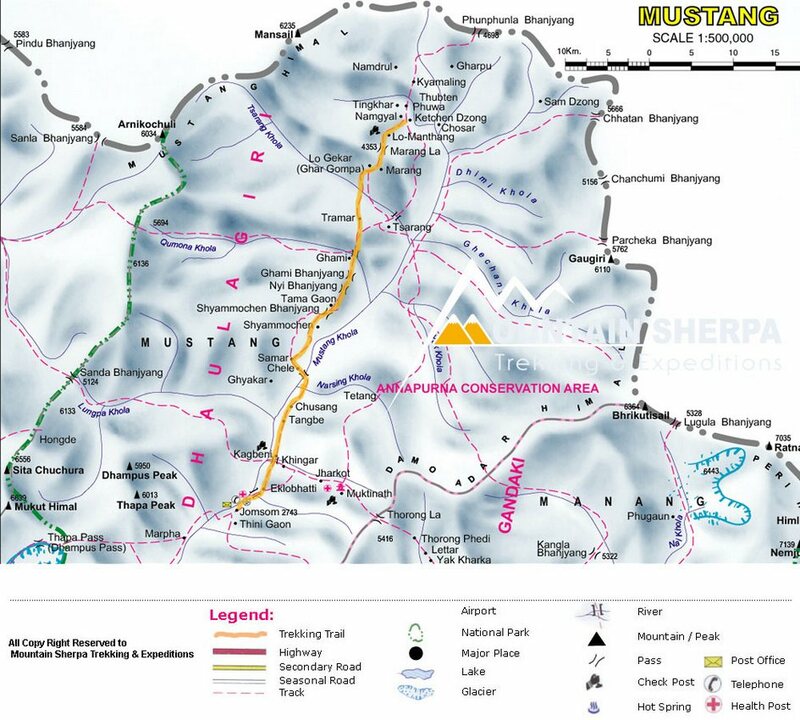 After that the insurgency fizzled (with the aid of a taped plea from the Dalai Lama making the case for peaceful resistance) and, fortunately for the residents of Mustang, the 10,000 Nepali troops sent to ‘settle’ the issue became superfluous. I spent two days in the capital of Lo Manthang. On the morning of the second we forayed into the surrounding hills. 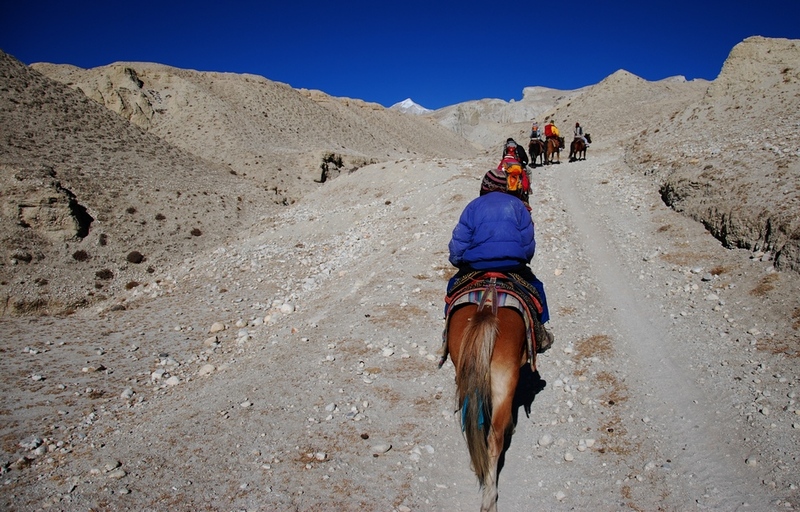 For this excursion we would be enlisting the services of Nepali horses and their accompanying horseman. I have never actually ridden a horse although I did once have a rather comical encounter with a relative in Thailand (by relative I mean donkey). I am not going to say I was handed the reins to a stallion but at least I had the right species……I think. There was definitely an adjustment period. In the beginning riding this horse was akin to me sitting in an oak chair while smashing my testicles into the seat with a repetitive up and down motion. Not so enjoyable. Additionally, I am not sure a six foot, four inch freak of nature is a good fit for these smallish horses. However, after a while I did start to get the hang of things and was actually enjoying the hell out of myself. This was made clear by my borderline maniacal laughter and perma-grin smile. Along the route to our destination (a cave complex to the north) I passed Team France, a hearty band of fifty something dudes with their wives. They did not appear to be enjoying their equine experience nearly as much. The temptation to slap one of the Frenchies on the back and scream, ‘Eeeeeeeeeeeeee-HAAAAAAAAAAAAAA!!! !’ while waving my hat in the area was overwhelming. Somehow I found the strength to resist my impulse. These caves were not particularly interesting although they did make for a few excellent photo ops. If only I been privy to the existence of the fabled caves of “Shrangra-La”. I could have mounted my own private expedition. Next time. Lunch was taken in a small village not far from the caves. I was brought to what I believe to be a private residence and served lunch in the host’s private prayer room, a sort of mini-monastery. Not long after I sat down an elderly gentleman entered and sat down cross-legged on the padded bench-style seats across the room. A young male I presumed to be his grandson or nephew explained to me that it was ‘prayer day’. He apologized for the interruption and offered to relocate us to another room. Apologize for engaging in sacred acts in one’s own home? Seriously? I informed my young host that I certainly did not mind and would like permission to stay if I would not be intruding. I was told such was not the case. So for the next half hour or so, while I enjoyed lunch I watched as this devout believer performed the ancient rites indicative of Tibetan Buddhism. As always the significance of what I witnessed was beyond my store of knowledge. Inquiring was out of the question for two reasons: 1) it would have been rude; and 2) I seriously doubt he spoke even a syllable of English. I sat there hypnotized as he rang bells, clashed mini-cymbals, banged the traditional drum, sprinkled water from a psychedelic teapot, and spread an unknown type of grain (probably buckwheat) upon the dirt floor. It was a privilege just to be allowed to enjoy the spectacle and although I was given the green light to take pictures I had not the heart for it. I could not justify what would have felt like the desecration of a sacrosanct moment. After lunch we went on an extended trot around the surrounding valley. My horse was exchanged for another and I felt as if I’d started over and all that horsemanship knowledge I'd acquired in the morning had vanished. It was back to the bone jostling, ball smashing extravaganza. Yes. 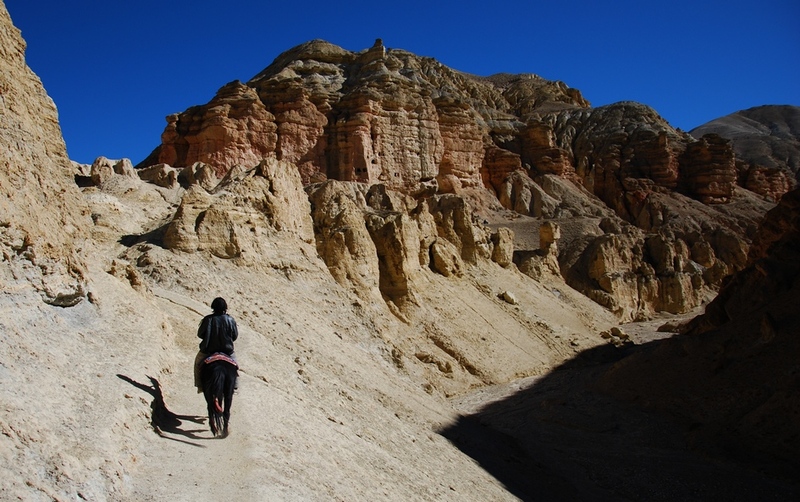 The land we passed through was much the same as the rest of the journey but for some reason the post apocalyptic nuclear holocaust feel to the region seemed never more poignant than when we were hop, hop, hopping along in the area around Lo Manthang. The brutal wind, scare inhabitants, and the soft echo of horse steps in the dirt did nothing to discourage the image. It felt as if I truly had located the end of the earth. 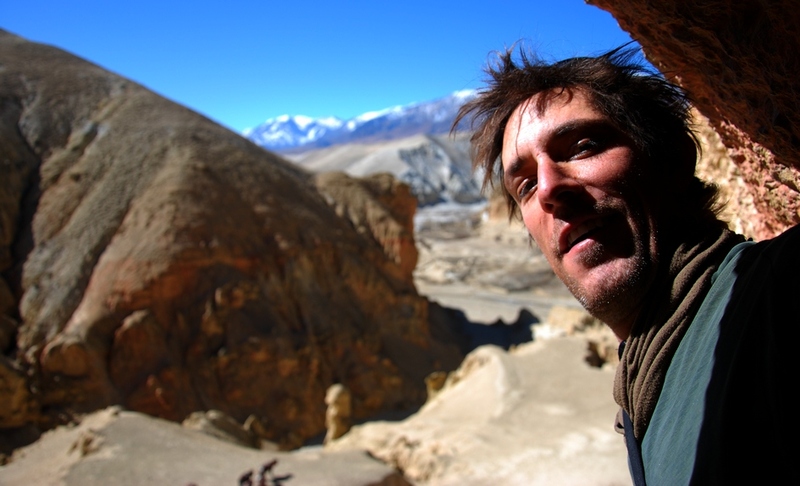 The late afternoon found us in the hills above Lo Manthang at yet another ancient monastery. By now the Wind Demon was particularly ornery and a constant gale was frequently stealing my breath. As we approached the monastery we noticed that a signboard in front of the adjacent school informed all visitors that classes were at an end and would be resumed in Pokhara for the winter. Forlorn would not describe the place. No people, a biting wind, and only those pleasant mastiffs I described before were stirring, if by ‘stirring’ I mean furiously barking/gurgling like they had just been smacked in the junk with a hot poker. One was particularly threatening and I found his/her incessant barking rather disquieting. My uneasiness mostly sprang from the fact that Benji was not tethered, making the only thing standing between me and a vicious mauling was the raised concrete platform (five or six feet from ground level) on which the monastery stood. Apparently, my threat was not grave enough to require a death lung or the surmounting of a set of concrete steps twenty feet away. Although Ram did not seem to sweat Cujo as much, I still believe that an attack was not such a outlandish idea, but what the hell do I know? After a few tense minutes a young guy did show up to let us have a look inside (after paying the customary 100 rps of course) and quiet the hounds of hell. This monastery was much less impressive than the others I’d visited and felt a bit neglected. 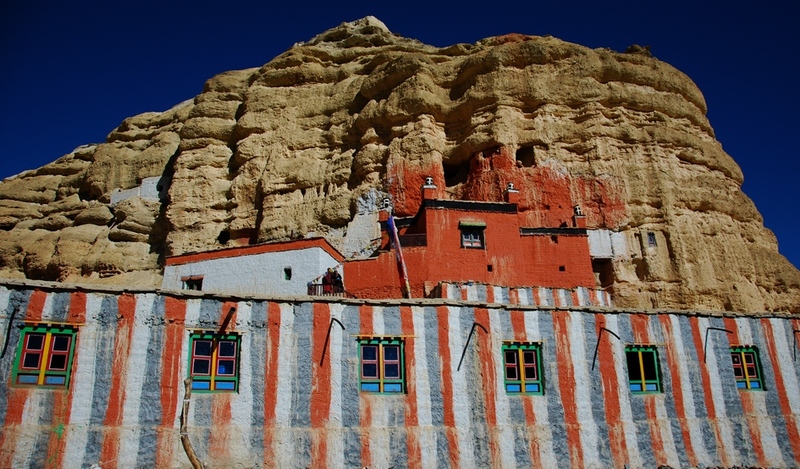 Then again, perhaps I was a bit jaded, this being my fifth or sixth monastery on the trip. The visit was short and the silence broken just before we left with, ‘So, this is the oldest monastery in the area.’ End explanation. 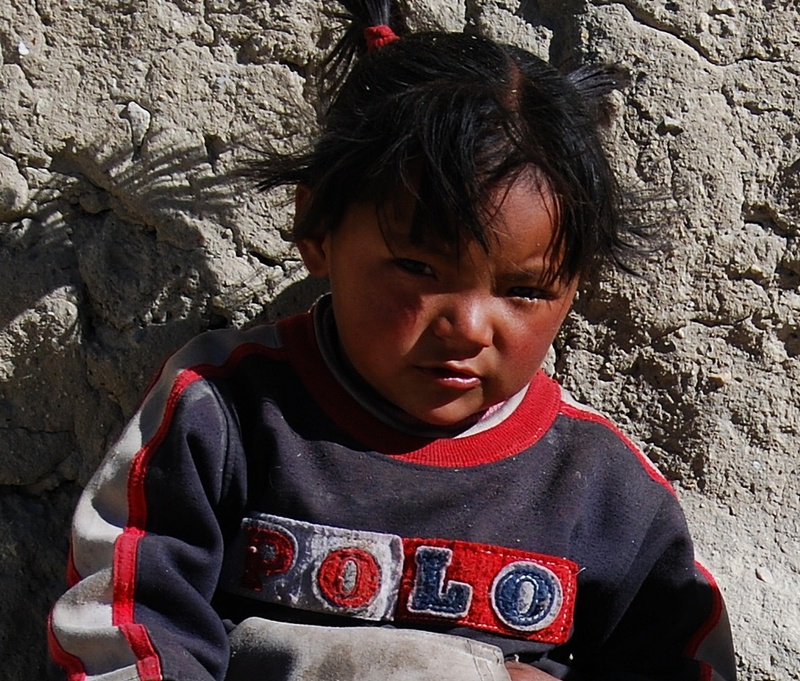 In the village below the monastery I encountered two small children sitting quietly in the dust. They both sat there in silence, the boy quietly playing with a homemade spin toy invoking just enough interest to warrant the activity, the girl staring in my direction if for no other reason than that being the most natural position in which to face her head. Something about this seen struck me. For lack of a better word it was ‘moving’ if not entirely poetic. At first I was simply photographing the scene behind them but upon closer inspection was compelled to get a closer look. At no time did they protest, or even react for that matter. No smiles, no sound. Just quite resignation. To what or whom were they resigning? Their fate? The inescapable, undeniable nature of their circumstances? That childlike wonder and innocence that often captures my imagination was nonexistent. These were the eyes of a village elder who long ago accepted the path the universe had laid out for them. But these were just toddlers. 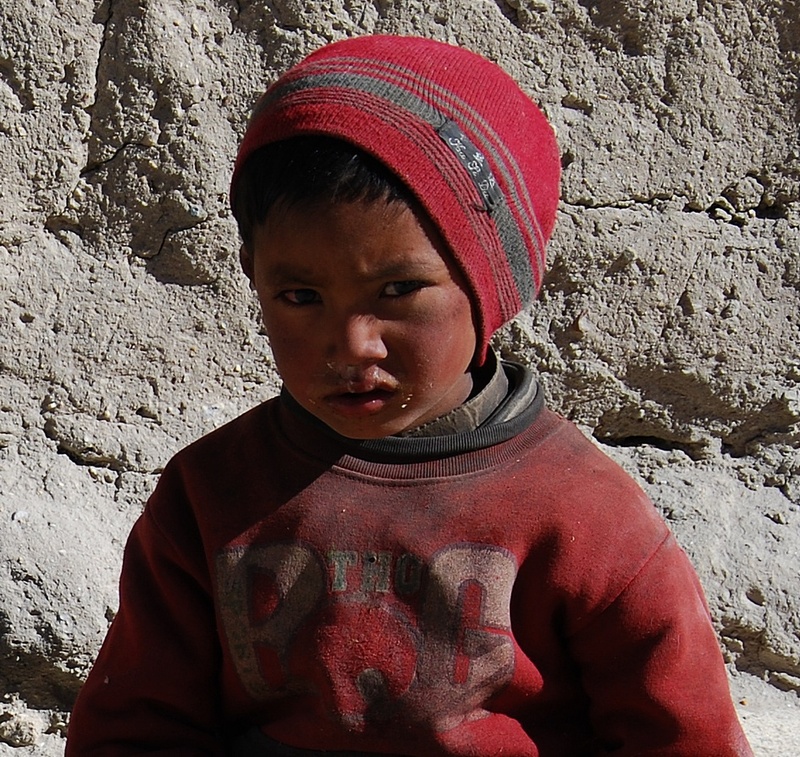 Normally, such kids are blissfully unaware of the struggle, the potential hopelessness and sorrow that surrounds them and is the inevitable result of existence in such a harsh environment far from the modern world. They sat there and barely shifted as I snapped a few photos with expressions that seemed to say, Go ahead mister, take your photographs. It matters little to us and we have not the strength to protest anyhow. You mean nothing to us, as we mean nothing more to you than a pathetic scene you encountered while on holiday. What are we to you? Nothing more than a coffee house conversation filled with pointless conclusions about the state of the developed world. When you return to shopping malls and high speed internet we’ll still be here in the dust waiting for someone to notice, to care. So go on. Snap your picture and go on your way. On more than one occasion I’ve felt guilty about snapping photos of local inhabitants even when given permission. It always feels a bit like I am exploiting their situation and somehow disrespecting their dignity as a sentient being. This was no different but something about the undeniable pathos permeating the scene compelled me to take some photographs. It is amazing how in the course of two or three minutes such a seemingly mundane scenario can stoke the fire of emotion and stop one in his tracks.